Wind energy is one of the fastest growing industries in the world and is a vital and competitive part in the world�s energy mix. It employs both professional and skilled workers in a number of different capacities and is expected to do so for many years. Huron Wind does not have any direct employees. Turbine maintenance on the farm is done by original equipment manufacturer�s employees. However, there are many wind energy companies who employ professional and skilled people. Specializing in mechanical, electrical, aeronautical, environmental and water resource engineers. Research and development groups employ engineers and experienced technicians to improve the design and efficiency of wind turbines. Turbine monitoring is carried out by a team of experienced service technicians. Responsibilities include diagnosing, troubleshooting and repairing system problems. 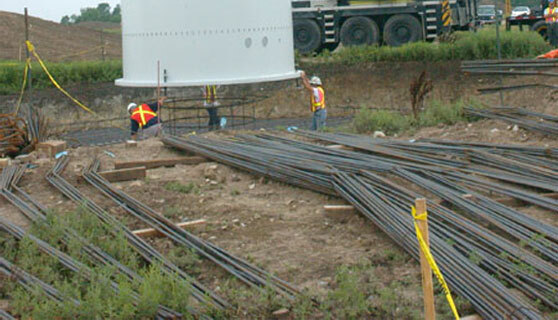 Technicians may also be involved in the construction and commissioning of new wind farms. Developers are responsible for overseeing the entire planning process including finance and legal fees, turbine installation, electrical grid connection and construction. Developers lead exciting and fast-paced careers in the realm of wind energy. This comprises knowledgeable individuals who conduct research, prepare reports, provide advice and consultations and administer programs in a variety of areas related to wind energy. Check out our Photo Gallery for some great pictures of putting up a wind turbine.